Eight years ago today, the Webb Companies announced CentrePointe, a shiny new development in downtown Lexington. The developers promised to spend $250 million. They promised Lexington’s tallest building. They promised exciting new tenants. They promised to build it by 2010. They promised 900 new jobs. They promised to revitalize downtown. Every one of those promises have been exposed as elements of an elaborate fraud designed to scam taxpayers out of over $100 million. Luckily for us, CentrePointe’s fraudsters are particularly inept developers. Their continual bumbling would have been comical – if not for the physical destruction and disruption they wrought in the center of our city. There was the mystery overseas financier with a pile of cash to fund CentrePointe. Who died. Without a will. His cash was in numbered Swiss bank accounts. There were the meetings in Zurich with the heirs, who were committed to CentrePointe. When that fell through, there were a succession of banks ready to step in. And the developer constantly emphasized how eager the banks were to get into this amazing project. Last year, there were all of the bond investors and underwriters who were so close to jumping aboard. But none of these financiers, banks, investors, or underwriters ever actually materialized. Bumbling. There were the new developers who emerged last August, and who wanted an even worse deal for the public than the Webb Companies did, before their scheme appropriately collapsed and they withdrew from the project. Bumbling. There was the never-ending chain of missed timelines and broken promises: The developers were always one approval or one transaction away from starting (or restarting) the project. They plastered ‘Coming Soon!’ billboards on the site. They always expected to break through in 30, 60, or 90 days. And as they blundered their way from deadline to deadline, eight years passed. Bumbling. There were the imaginary collections of eager tenants. JW Marriott! Hard Rock Café! House of Blues! Jeff Ruby’s! Urban Active! Stantec! And then there were the 61 (or 64! or 65!) ‘handshake’ deals for CentrePointe’s million-dollar condominiums. Every one of which backed out – or was never actually involved in the first place. Bumbling. There were all of the pretty pictures of ugly designs, as the developers discarded architects like underwear. Bumbling. There were the fantasy financial projections. CentrePointe’s fraudsters attempted to use public tax increment financing to help fund the project. Using aggressive and unrealistic assumptions about their hotel, retail, office, and residential tenants, they implied that CentrePointe would have a greater economic impact than ever possible. And they used these artificially inflated business models to convince state and local leaders to support the project with public taxes. But even when they rigged the game in their favor, they were unable to pull off their deception. Bumbling. Finally, there was the developers’ hilariously amusing tendency to wildly lash out at their sharpest critics (including me once back in 2009). In these kneejerk responses, they almost always portray themselves as victims and defiantly attack the motives and the intellect of their critics, while unintentionally betraying a deep sense of shame at their own impotence. Bumbling. Meanwhile, the CentrePointe block itself actually regressed. The historic, dilapidated buildings on the original site were pounded into an ugly pit of rubble in 2008. In 2009, the developers topped the rubble with dirt, creating a downtown dust bowl. The poor drainage on the site meant that it turned into a mosquito-breeding pond whenever it rained – as it did a lot that summer. In 2010 – in tacit acknowledgement that little was likely to happen on the site – the developers created a tiny horseless horse farm, complete with wooden fence. 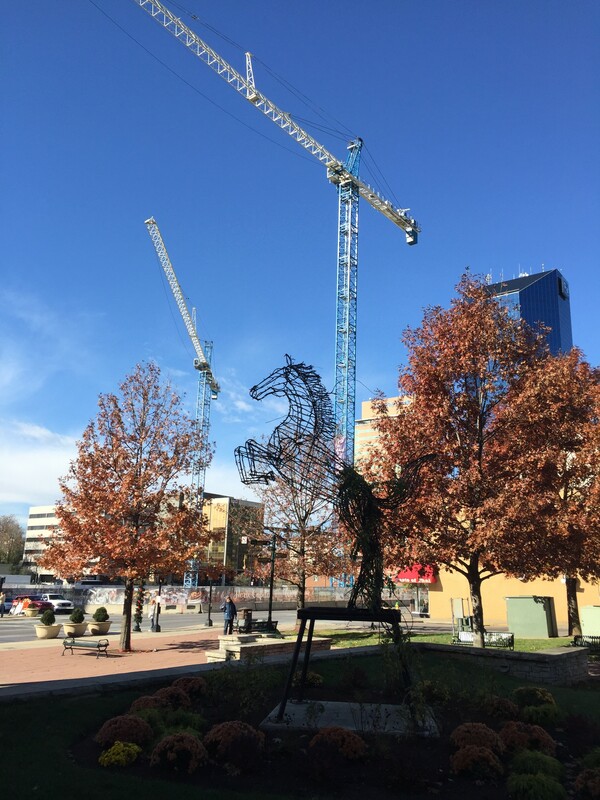 Four years later, they blasted a 30-foot deep hole in the ground, and quickly erected cranes which have since been largely inactive. Today, the motionless cranes remain the only significant structures on the site. For the past two years, no progress has been made on CentrePointe. The past eight years have seen the site move from a functioning part of the community to a blighted eyesore and nuisance. As I read through the most recent CentrePointe developer screed [PDF] from this week lashing out at the city, the press, and social media for not coddling the developers enough, I reflected on the past eight years. Eight years later, we’re left with an endless stream of empty promises, no jobs, and Lexington’s biggest hole. The plans for CentrePointe have become cheaper, smaller, later, and less grand. And less likely. CentrePointe – or whatever it is ultimately called – will never be built until a competent developer takes over. With their agreement with the city that they must fill in the site if it sits idle for more than 60 days, I expect that these developers will attempt to string the city along with superficial actions. Every couple of months, they’ll rearrange the deck chairs of this land-bound Titanic, but it is still doomed: They won’t actually build a thing. In writing about CentrePointe over the past eight years, I’ve declared CentrePointe a scam, a con, and a fraud. I must admit that I used these terms somewhat loosely and provocatively, and I always meant to. I never intended the terms in a strictly legal sense. But why not? CentrePointe is definitely a bumbling eight-year-long failure on the part of developers, but could it actually sink to the legal qualification of criminal acts? Did the developers knowingly lie and deceive the public and public officials in a naked, greedy attempt to loot our treasury? Well, the developers certainly lied. They lied about the building. They lied about the design. They lied about the tenants. They lied about the financiers and the financing. They lied about the timeline. They lied about the business plan. They lied about what they spent. They lied about the economic benefits. They’ve lied so much that they lose track of their lies. * And their lies are well-documented. And if they actively deployed these lies to obtain public financial support for which they weren’t properly qualified, well, that sounds like fraud, attempted fraud, or conspiracy to commit fraud to me. Is CentrePointe really a crime? I don’t know. But now – eight full years into this debacle – might be a good time to ask. * In August 2014, for instance, they claimed that they had already spent $29.4 million on CentrePointe. In their screed just this week, they claimed the less impressive figure of $28.0 million. So, which is it? In 2009, an analyst hired by Kentucky’s Cabinet for Economic Development evaluated the CentrePointe development project in downtown Lexington. The analyst looked at whether the Tax Increment Financing (TIF) that the developers proposed using made any sense. At the time, CentrePointe was slated to be a $298 million project, and the developers wanted to use Kentucky’s new TIF law to help subsidize the project. Under TIF, the state and city would issue bonds to investors, and pay those investors back (with interest) by using the incremental taxes generated by the new development over the next 30 years. The TIF law stated that projects like CentrePointe needed to invest a minimum of $200 million in capital to qualify. The analyst expressed skepticism about projects like CentrePointe – the real estate market was imploding in 2009. CentrePointe’s developers assured the analyst that the project was a sure bet: there was a mystery overseas financier willing to front all of the cash needed to build the project; there were top-notch tenants lined up (“Hard Rock Cafe”, “J.W. Marriott”); 65 of the 91 million-dollar condos had already been sold in handshake deals; the office and hotel spaces would have exceptionally high occupancy rates (even though they would also have exceptionally high prices). Taking all of the developers’ assurances into account, the analyst thought the project would generate about $93 million in new taxes for the public. Sounds great, right? Except that the same analyst found that CentrePointe’s bonds would also cost the public about $96 million to finance. As CentrePointe repeatedly evolved over the ensuing years, it also repeatedly shrank. From the nearly $300 million sizing used for the 2009 assessment, the project shrank to $250 million, then $200 million. CentrePointe was shrinking to the point where its TIF funding was at risk. Then, early last year, CentrePointe’s developers successfully lobbied the state legislature to lower the minimum capital investment needed to qualify for TIF to $150 million. 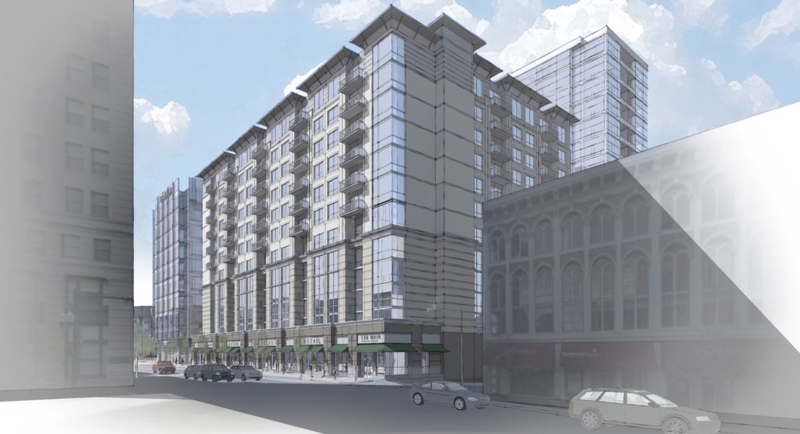 In June 2013, the developers re-applied for TIF subsidies with a new, scaled-down CentrePointe. The state hired the same analyst to evaluate CentrePointe, which was then estimated at $193 million (over $100 million less than in 2009). In their estimates, the analyst now estimated that the new Centrepointe Jr. would generate about $49 million in incremental taxes – about $23 million less than in the 2009 estimates. This makes sense. As the size of the project shrinks, the incremental benefit also shrinks. The problem? The new proposal still required an investment of $93 million to finance the CentrePointe bonds. According to the state’s own analyst, the CentrePointe TIF bonds would be an extraordinarily bad investment in which bond investors would hand over $93 million, only to lose $44 million in the process. Despite this extraordinarily negative analysis, the state and city decided to approve the TIF application for CentrePointe anyway. Earlier this year, the developers began digging and blasting for a proposed $32 million parking garage on the site. With the huge hole nearly complete, the developers have returned to the state and city to request that the TIF bonds for the garage be issued now – before the developer has spent anything close to the $150 million capital investment that is required to qualify for TIF. In essence, the developer is requesting that the city and state take on a $32 million bond commitment (with an additional $33.5 million in financing obligations – $65.5 million total) on the dubious promise that the yet-to-be-built CentrePointe will someday generate enough new taxes to pay off bond investors. This simply isn’t how TIF works. You don’t get the tax-funded financing before you build the thing which generates the taxes. The state’s economic development analyst says that CentrePointe bond investors will never get paid back. And the analyst is undoubtedly correct. If there really is no risk to taxpayers, then why do the developers need the city’s help in issuing TIF bonds? Why involve the city at all? After all, the developers could always pursue financing through normal real estate investment markets. The reason is that they need the city’s help in creating the impression that the bonds are a safer investment than they really are. But CentrePointe bonds aren’t a safe investment at all. In fact, they are likely to lose money for bond investors, because the project will never produce enough new taxes to pay investors back. But the developers can’t let investors know that. 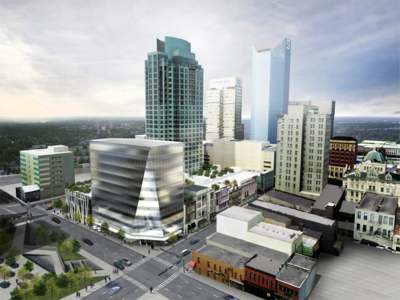 Savvy investors would look at the risky business model of CentrePointe and refuse to fund it. So the developers want to use our good name and credit ratings to help them deceive and defraud those investors, to assure them that the public stands behind those bonds and that the bonds are safe. The developers have attempted to maintain a veneer of respectability in our community – frequently pointing to their many, many development projects around Lexington as proof of their virtue. And CentrePointe fits the developers’ well-worn modus operandi of privatizing gains while socializing risks throughout those projects. CentrePointe represents the very worst of corporate cronyism. By using an obscure and ever-shifting financing scheme, the Webb Companies are attempting to commit state-assisted fraud, while lining their own pockets and hoping that no one notices. They’ve hoodwinked the Cabinet for Economic Development. Twice. They’ve hoodwinked the Urban County Council. At least two times. Now they want to hoodwink the Kentucky League of Cities. These aren’t the actions of upstanding citizens. These are the actions of con artists and swindlers. They should be treated as such. Imagine, for a moment, that you build houses. You’re a competent – and pretty crafty – builder, so you earn a profit of 10% of the sales price on each house you build. You’ve found a cheap lot on the edge of town which is a decent prospect for a $125,000 home design. At your 10% margins, you’d usually stand to make $12,500 on this house. Trouble is, your land is in the middle of nowhere: the nearest street dead-ends before it even reaches your lot. You know that paying to extend the street will cut into your profits by $5,000, and you definitely don’t like that. As you’re thinking really hard about how to avoid having to pay for the street extension, you hit upon a really crazy scheme: What if, you think to yourself, I could not only get our town to pay for the street extention, but I also got them to finance the house’s two-car garage! But how could you possibly convince the townsfolk to fork over the $25,000 needed for the street extension and the garage? The town is already struggling with its finances, and you know your proposal won’t go over well. Why should the town pay for a private garage? And here is where you get your craftiest. Building the house will generate higher property taxes for the town over the next few decades, where today there is just a vacant lot. The construction will increase economic activity for the town as you pay for supplies and labor on the site. The house will bring in working residents, who will generate new payroll taxes for the town. The garage and street extension – ‘public infrastructure’, as you now call the garage and road that you need more than anyone – are essential to this future tax revenue. You’ll point out that no one will buy a new house without a garage; and without the garage, the town won’t get the benefits of this project. 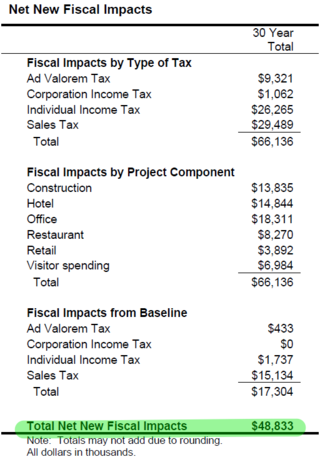 Yes, the town would have to borrow the $25,000 (and, over the years, pay another $25,000 in interest) to help fund the ‘infrastructure’, but you’ll point out that the new property and payroll taxes will offset those costs. Finally, to sweeten the pot, you artificially inflate the price of your house by 20% to $150,000. You know the project is really only worth $125,000, but boosting the price by 20% has the nifty effect of inflating the estimated ‘benefits’ by 20%, which makes the whole scheme easier to sell. You know you are way out on a limb with this scheme, but – who knows – maybe the town will go for it. And why would they? Because you’ve done the math, and you’re betting that they haven’t. If you had paid for the street extension on your $125,000 house, you would have spent $117,500 and pocketed $7,500 – a tidy 6% profit. Not what you usually make, but a profit nonetheless. But if you can get the town to finance the street and the garage, that removes $25,000 from your cost. Now, you can build the $125,000 house for just $92,500 out of your pocket (and another $25,000 out of the public purse), and you make a cool $32,500 profit for a 26% margin. If you can get the town to go for your scheme, you’ve ‘magically’ quadrupled your profits. So you package up your scheme and present it to the town’s economic development manager. You brace for her to laugh you out of her office, but have decided that you can live with a little ridicule in exchange for the chance – however remote – to quadruple your income. She knows that you need the garage and the street extension more than anyone, and isn’t sure what valid public interest the town has in helping with the house you want to build. She know that you need to build something on the lot anyway even if you don’t get the town’s financial support. She’s not sure she believes that your project is really worth the $150,000 you are claiming. Even if it is worth $150,000, she thinks your estimates on how much the town stands to benefit are extremely exaggerated. She appreciates the ingenuity of your argument, but the whole scheme strikes her as farcical and not really worthy of being called an ‘economic development initiative’. And yet, she also knows that you are close to several members of the town council. She seems to recall a picture of you with your arm around the mayor in the local paper. She suspects that you have contributed to several local political campaigns. These connections intimidate her. So she decides to pass the whole suspect bundle (and the decisionmaking) along to the town council. And to your delight, the council routinely passes your scheme with only modest resistance. They simply require that you spend at least $100,000 on your project to qualify for these incentives. Just as you rub your hands in glee at the prospect of making so much money, the economy takes a nosedive. Banks aren’t willing to lend for housing construction, even for a ‘sure thing’ like your project. After a long delay in lining up financing, you return to the town council with a proposed amendment to your initiative. You ask for a ‘hardship exemption’ to lower the total amount which needs to be spent on the project to just $75,000, even though you initially justified the town’s financial involvement based on the inflated $150,000 amount. You hope that no one notices that a half-sized project would only generate half-sized benefits. And, sure enough, the town council unanimously approves your amendment without debate. No one noticed. Or, more accurately, no one publicly objected. At this point, another important revelation strikes you: The smaller your project gets, the more you come out ahead. You now figure that you can finance and build an $80,000 house on your lot. If you had built on your own, the house would have cost you $72,000 to build, plus $5,000 for the street improvments, which would have left you with about $3,000 in profit. At just under 4%, the margins are substantially less than you usually make, but the project is still profitable. But the town is still on the hook for the same garage and street extension – even though the overall house has shrunk. So you’ll really spend $52,000 to build your $80,000 house (while the town still pays $25,000), and you’ll clear a neat $28,000, or over 9 times as much as if you built the project on your own. The town’s ‘public infrastructure’ commitment lets you multiply your profit as the overall project shrinks. You put in less money and get higher return on investment. You are quite crafty, indeed. Yes, this thought experiment is ludicrous, if intriguing. And no town would ever support such a ludicrous scheme. The above fable is true. Mostly. It’s just 2,000 times too small. Multiply all of the dollar amounts by 2,000, and you have the fiscal outlines of the CentrePointe project in Lexington. Just substitute ‘town’ with ‘The Commonwealth of Kentucky’ and ‘Lexington’. Then substitute ‘you’ with ‘The Webb Companies’. Substitute ‘house’ with ‘CentrePointe’. And substitute ‘incentive’ with ‘Tax Increment Financing’ or ‘TIF’. CentrePointe started as a $250 million project in 2008. As it sought state and local support for $50 million in ‘public infrastructure’ (including a $30 million parking garage), CentrePointe’s cost ballooned to $300 million. After getting approval for Tax Increment Financing incentives from the state – based on that $300 million price tag – CentrePointe still couldn’t get financing, and stagnated. After continual financing troubles and multiple revisions, last week CentrePointe’s developers got unanimous approval from both houses of the state legislature to drop the overall project size to just $160 million – while still receiving the full TIF incentives of the inflated $300 million version of the project. In other words, no one noticed that a half-sized project only generates half-sized benefits to the state and city. No one recalibrated the incentives when CentrePointe shrank. In the process, The Webb Companies multiply CentrePointe’s profitability with no additional risk to themselves. We’ve often called Tax Increment Financing (or TIF) a scam or a con. While this sounds like hyperbolic exaggeration, we think what’s actually happening is sleazy enough to merit these labels. First and foremost, the developers shouldn’t need public help. They benefit from this ‘public infrastructure’ more than anyone else, but have no financial stake in it. The theory of TIF is that the taxes stemming from new economic activity will pay for the infrastructure. In return, the city gets the benefits of increased economic activity. That’s the theory. But the reality is quite different. The most aggressive, best-case scenario from the state’s economic development consultant showed the city and state tax increments not quite breaking even after 30 years. All of the incremental benefits that the project is supposed to bring are plowed right back into debt and interest payments which benefit the developers. So in return for taking on $50 million in debt and $50 million in interest on behalf of the developers, the public gets nothing after 30 years. Nothing. And that was the best case? Wait. It gets worse. The consultant’s ‘not quite breaking even’ case was based on CentrePointe at its bloated $300 million apex. Now, CentrePointe is a half-sized $160 million project. At this reduced size, CentrePointe can never pay the city and state back for the infrastructure investment. The developers need the parking garage. The developers would benefit most from the parking garage. Even so, the developers have managed to offload their parking garage costs onto others, using public taxes to do so. Second, this means that TIF allows The Webb Companies to socialize the many risks of CentrePointe while privatizing the gains. Bondholders and the public take on the risks that CentrePointe might fail to live up to the promised (and unlikely) stream of tax revenues, while the developers avoid (and pocket) the costs of a $30 million parking garage. 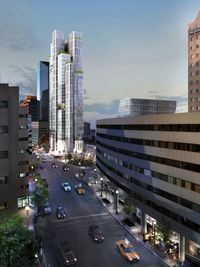 The developers get the benefits of a parking garage to serve CentrePointe, while someone else gets stuck with the tab. Will bondholders or the public ever get paid back? Maybe. Maybe not. We’re pretty sure that they won’t. In any case, none of this is the developers’ concern. They get a big parking garage – essentially for free. From a developer’s point of view, TIF offers all upside with no downside. The fact that all of those statements were false is beside the point. There was little downside to lying or being profoundly wrong. And the developers were repeatedly, incredibly, and thoroughly wrong. With no downside, their multi-dimensional wrongness helped the developers secure a $30 million windfall at public expense. Fourth, as the nature of CentrePointe shrank and changed, the TIF funding stayed the same. CentrePointe’s TIF was approved when the developers were proposing a $300 million project. At that time, the developers also promised that they had financing in-hand. They promised 91 residential condominiums at a $1 million average price. They promised to begin construction in March 2009. None of these overly optimistic assertions turned out to be remotely true. The project shrank to half its approved size. The size and mix of residential, retail, hotel, and office activity changed dramatically. The project slipped 4 years (and counting) past its promised construction start date. But none of these facts changed the city’s or state’s TIF obligations. CentrePointe is a fundamentally smaller and different project than when it was proposed. Yet the developers’ rewards remain the same: The developers still get a $30 million parking garage, at public expense. There appear to be no mechanisms at the state or local level to revisit the TIF commitments when a project fails to live up to its rosy projections. And CentrePointe certainly failed to meet those projections. Worse, TIF actually rewards the developers for shrinking the size of the project: The smaller the project gets, the greater the developers’ return on investment. The Webb Companies appear to be able to alter the project on every whim of the developers. They can and have overpromised and underdelivered. And the city and state appear to have no recourse – or desire – to reevaluate their support of the project. Fifth, state law is maddeningly unclear about what happens if a TIF project fails to deliver on its promises. The law goes into great detail about how to subsidize the developers, but it does not make clear who pays when the project falls short of projections. When a TIF project is approved, it allows the city and state to take on debt by issuing special TIF bonds. In return for $50 million from bond investors, the city and state promise to use a steady stream of taxes coming out of the new economic activity at CentrePointe to pay back the $50 million (with another $50 million in interest) over the next 30 years. 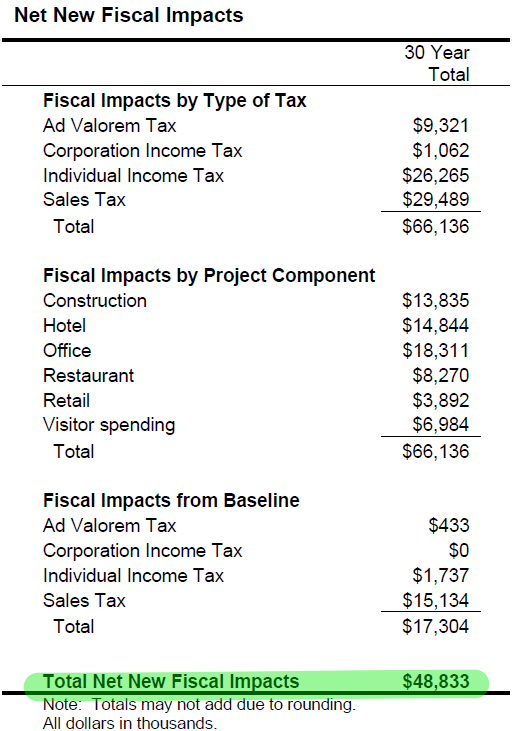 Under the original best-case assumptions from the state’s economic development consultant in 2009, taxes from CentrePointe just missed fully paying for the bond payments. Since 2009, however, everything changed. The project got much, much smaller. 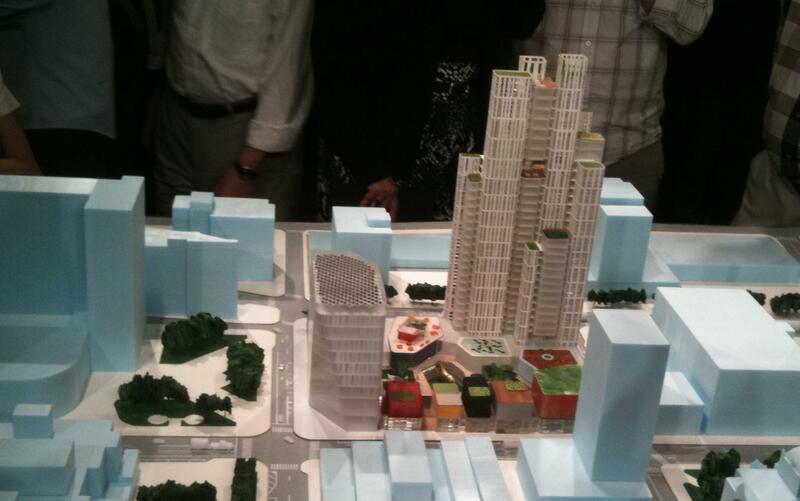 Key assumptions justifying TIF for CentrePointe have crumbled. In other words, it is not remotely possible for CentrePointe to generate enough taxes to pay back the bond investors. Three years ago, we re-ran the consultant’s analysis for CentrePointe using (in our judgment) generous-but-realistic assumptions. The result: Taxes from CentrePointe only generated 20% of what was needed to pay bond investors. And that was before the project shrank another $40 million – rendering even our dreary projections too optimistic. So the state and city issue TIF bonds. And the CentrePointe TIF can never pay the bond investors. Then what? If the city and state default (i.e., fail to pay) on the bonds, whose credit rating takes a hit? Who is responsible for the shortfall? Some analysts assert that bondholders would be on the hook for any shortfall. But then, any bond analyst looking at CentrePointe would recognize that they’d never get paid, and investors would flee. Then where do the TIF funds come from? It is hard to look at the CentrePointe TIF without realizing that there is great risk of loss to state and local taxpayers, as well as bond investors. It is also hard to look at the CentrePointe TIF without realizing that The Webb Companies incur no risk at all. Finally, the fact that the city and state sanction TIF for CentrePointe doesn’t make TIF more legitimate; It makes TIF more despicable. TIF is the worst kind of reverse-Robin-Hood welfare scheme for developers. At a time when the state and city are starving for money, TIF uses public tax dollars to help reduce the developers’ expenses and helps line their pockets. It transfers risk away from the developers and to the public and to investors. It literally takes from the poor and gives to the rich. The CentrePointe TIF is a con. The fact that the city and state assist in the con doesn’t make it any less of one. We’ve often had fun at the developer’s expense with CentrePointe, pointing out their serial incompetence and their tendency to lie and exaggerate. But the truth is that their ‘incompetence’ and mendacity have served them quite well. It has helped them dramatically compound their profitability and reduce their risk. All at public expense. 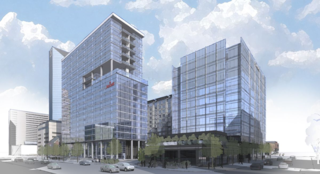 Five years ago today, the Webb Companies announced CentrePointe, a then-$250 million downtown Lexington development effort which planned to produce 900 jobs and the city’s tallest building on one block in the center of the city. Citing the urgency of the project, the developers moved quickly to demolish several neglected-but-historic buildings on the block. The developers made some cosmetic efforts to clean up the site, ultimately transforming the pit of demolition rubble into a tiny pasture, complete with horse farm fencing. But actual construction never began. Today, CentrePointe is still stalled. Over the past five years, the developers have repeatedly revised their plans and their explanations for delay. At every revision, construction was imminent, slated to begin “60 to 90 days from now”. 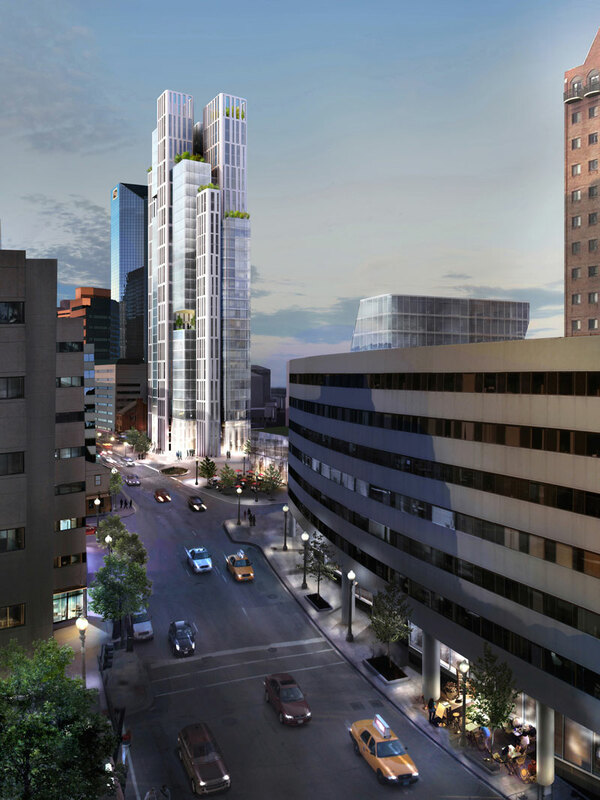 The financial and physical ambitions of the project have shrunk somewhat: the plans now call for a $200 million development which no longer includes the city’s tallest building. 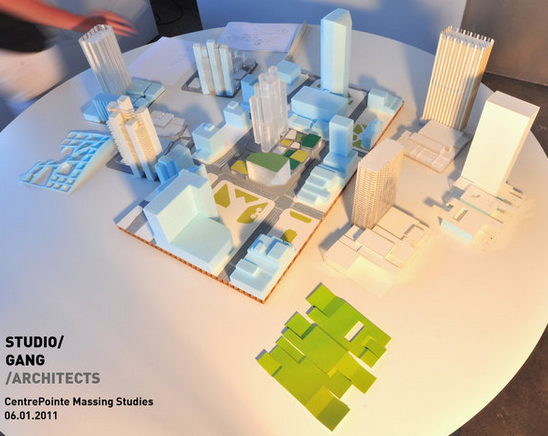 Instead of the hulking monolith of the first three designs, the developers are now pursuing a less-imposing design which promises to blend with the surrounding city much more effectively. But approval for the developers’ fifth major design iteration expires next week, and we’ve seen little progress on CentrePointe over the past year. After five years, we have no economic activity on the site. No construction. No jobs. No building. No progress. 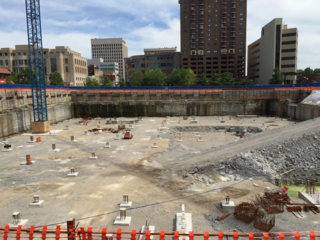 Over the years, we’ve been frequent critics of the CentrePointe project. Those critiques have stood up well to history. The fifth anniversary of the announcement of CentrePointe, as well as the expiration of the project’s fifth design, seem like a good time for us to take stock of what Lexington should learn from the five years of failure with CentrePointe. Hopefully, we can apply some of these lessons to CentrePointe (and to other major development initiatives in the city). They lied repeatedly. And with no trace of shame. It isn’t a pleasant or polite thing to say, but Lexington needs to stop being polite to hucksters and charlatans. They lied about their secret mystery financier. They lied about his death. They lied about his heirs and ‘numbered Swiss bank accounts’. They lied about backup financing. They lied about backup financing for the backup financing. They lied about the urgency of demolishing historic buildings. They lied about their schedule. They lied about tenant commitments. They lied about 61 (or 64! or 65!) ‘handshake’ deals for their condominiums. They lied with pretty pictures of ugly buildings. They lied with pretty pictures of pretty buildings. And they lied with overly optimistic financial projections. They lied to the press. They lied to the public. They lied to the Urban County Council. They might have even lied to themselves. And when their thick layers of lies wore thin, they resorted to insulting and bullying their critics instead of offering substantive rebuttals. CentrePointe has always depended upon tax-increment financing, or TIF, to support approximately $50 million of the project. TIF allows cities and states to allocate future incremental tax revenues to finance today’s public improvements related to new economic development initiatives. The logic behind TIF is that the increase in economic activity which stems from a new project will generate taxes that will – eventually – pay back the state and city for improving roads, sidewalks, utilities, parking, or other infrastructure around the project. Sounds reasonable, right? Build CentrePointe; generate new economic activity; generate new taxes from that activity; use future taxes to help pay for the “public” parking garage which CentrePointe needs to be viable. The city issues CentrePointe TIF bonds to investors, uses the investors’ money to build the CentrePointe parking garage, and pays back investors (with interest) out of the tax revenues from all of the economic activity CentrePointe creates. But here’s the core problem: CentrePointe never generates enough economic activity to pay back bondholders. How’d this happen? CentrePointe’s developers used wildly inflated projections to qualify for TIF, and few city or state mechanisms were in place to effectively challenge the developers’ assertions. And therein lies the problem with TIF more broadly. Developers have every incentive to exaggerate their estimates of a project’s value to the community. If the project comes up short of their rosy projections, developers still reap the benefits of TIF (“Free parking garage!”), while taxpayers and bondholders assume all of the risks. Those supporting TIF programs often assert that only bond investors bear the risk of project failure. But that rarely happens. As LEO’s Joe Sonka meticulously chronicles with Louisville’s Yum! Center (another state-sanctioned TIF program), the reality is that taxpayers are the true backstop when a project fails to live up to its projections. TIF amounts to little more than an elaborate corporate-welfare scam. With no downside risk, developers have no motivation to be realistic in their projections in their pursuit of state and local support, while state and local governments provide few checks on that runaway optimism. Further, TIF provides developers with their infrastructure goodies now, and in exchange taxpayers and bondholders get a trickle of unreliable and unpredictable tax revenues over the next 30 years. So far, the saving grace for the CentrePointe TIF has been that the developers have been unable to secure financing for the rest of the project, and haven’t yet been able to invoke the state and city support needed to build the parking garage. Perhaps because the design has changed so often, many CentrePointe critics – including us – spent much of their time obsessing on the project’s design. This was especially true when the design got good following Jeanne Gang’s involvement in June 2011. Because the Studio Gang process was so inclusive, many in the community felt a sense of ownership of the resulting design. But the reality is that the design of CentrePointe matters very, very little in comparison to the finances of CentrePointe. Pretty pictures are nice, but pretty pictures crumble without viable financing. (And they have crumbled several times without viable financing.) Pretty pictures don’t matter as much as pretty business plans. And CentrePointe has never had a pretty business plan, even when it had pretty designs. The state’s agreement with the city specifies that at least $200 million be spent on CentrePointe by 2016 in order to qualify for TIF. And the project’s price tag has dutifully maintained that $200 million threshold over the past 5 years. As a result, CentrePointe has always been big and complex; it contains residential, retail, hotel, and office components. The viability of the project requires the success of all of these components – if any one fails, the whole project fails. This is why the developers have had five years of trouble securing financing. A project of this size and complexity is inherently fragile. A smaller project (or collection of smaller projects) would likely be much more robust, but then it wouldn’t qualify for TIF funding. When projects get bigger and more complex, there’s greater risk for something to go wrong. CentrePointe’s size is a liability, not an asset. Speculation is not economic development. Speculation is gambling. The developers gambled. They gambled with historic buildings. They gambled that they could get financing before the economy crumbled. They gambled that they could get they city to help finance part of their project. They gambled with the center of our city. And we lost, too. We lost a little of our city’s history. We lost economic activity. We might lose even more if the project goes forward. These are just a few of CentrePointe’s lessons for Lexington. There are undoubtedly many more (for instance, I haven’t delved into the project’s many historic preservation failures here). Feel free to add what you’ve learned over the past five years in the comments below.